Not many people remember that Diane Ravitch was for Common Core before she was against it, and what turned her against it was the certainty that any benefit of second graders all learning to write memos rather than reading Mrs. Frisby . . . would be negated by an increase in testing--which she had come to understand to be the tool for destroying public schools. 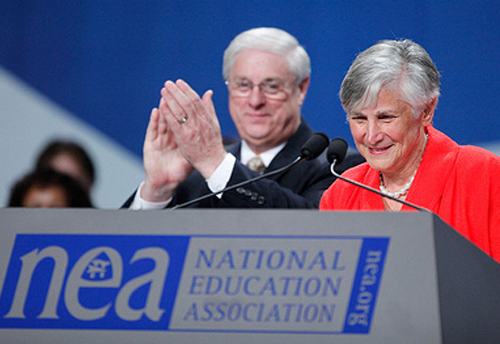 The National Education Association under President Dennis Van Roekel (left) has been an even bigger supporter of Common Core than the AFT under Randi Weingarten. Now Ravitch's friend, Randi Weingarten, has suddenly decided to "uncouple" testing from Common Core. PhilaKen and whole bunch of other folks at the Ravitch blog have noted that Common Core without testing is like sunshine without the sun, but for some reason Ravitch now thinks that vampires without a blood supply are possible (choose your own metaphor). What information does she and Randi have that is not being shared with all the teachers who read Diane's every word and who pay Randi her $400,000 salary? Did this new dynamic duo get the memo from the corporate foundations and the BRT that CorpEd is ready to cut a deal, i. e., give up VAM-based testing to evaluate teachers in return for support for Common Core, with modifications promised sometime down the road based on teacher "input?" This scenario has been floated out in Tennessee already, and it remains uncertain as to whether the teachers' association there will swallow the bait or go to court. If such a loser deal went down nationwide, with AFT and NEA signing on, that would only mean that the most outrageous, unfair, invalid, and unreliable use of high stakes testing would go away, which will disappear, anyway, as teachers go to court based on documented damages to lives and careers. That would only leave all the other misuses of standardized tests to sort, segregate, punish, threaten, shut down schools, and turn urban schools in anti-cultural chain gangs focused on corporate "neuroscience" as the new eugenics tool. The Common Core is the testing delivery system for the next generation of CorpEd deformations. It has to be stopped, and it has to be stopped now. One last comment here. The most peculiar part of Ravitch's responses to those writing to her post yesterday against Randi was this, in response to the suggestion that Weingarten should be tarred and feathered or resign (I forget which): "You have to decide if you want to go into battle with no leaders against a well-organized army." Does Ravitch believe the AFT will be left rudderless and leaderless when Weingarten is forced out? Is Weingarten the only person suited to lead the opposition to CorpEd, which so far she has only supported? Does Ravitch really believe what she is saying? Or is this more wishful thinking, which is what has gotten many people than just herself into big trouble.